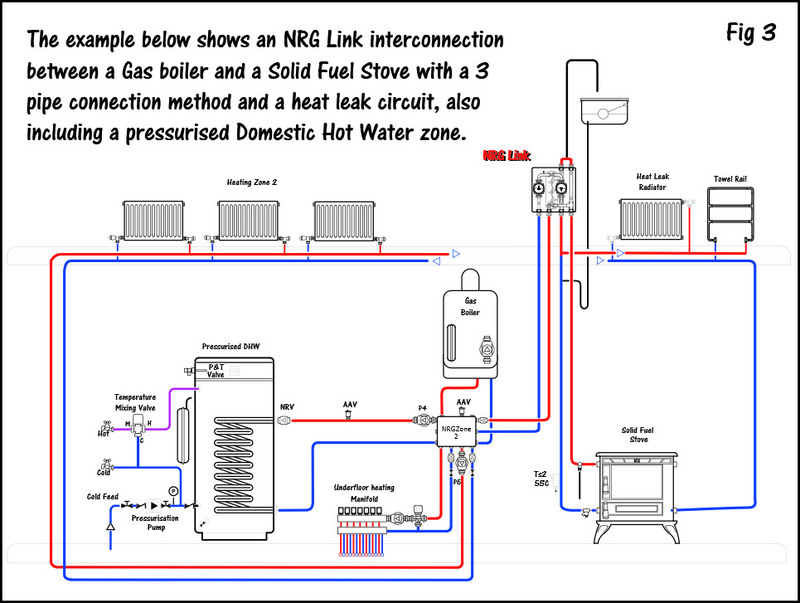 NRG Link is a very simple, yet highly effective system inter-linking solution from NRG Awareness, used to interconnect open solid fuel systems to sealed heating systems in a patented and uniquely safe way. 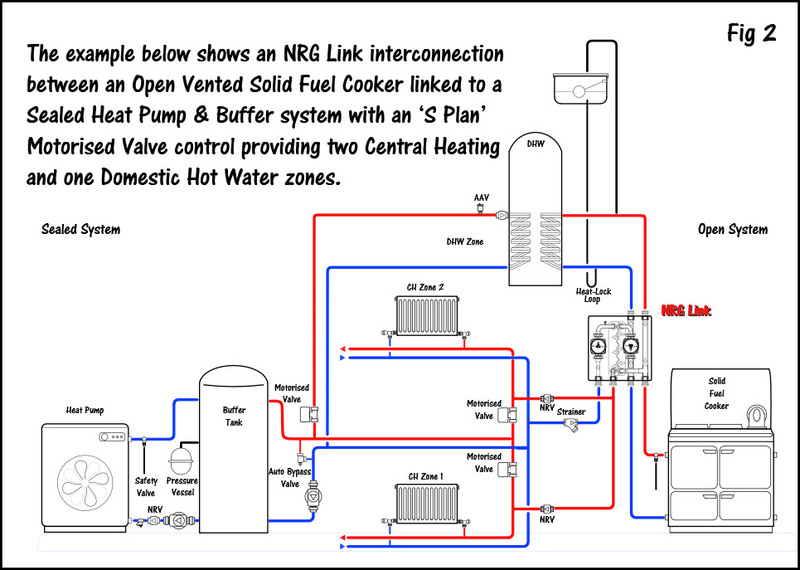 NRG Link provides for an unobstructed gravity heat leak circuitfrom a solid fuel appliance that incorporates an open expansion and cold feed. It is designed to transfer the heat from the solid fuel appliance into the sealed system. The unit is completely insulated with a built-in plate heat exchanger, pre-wired primary & secondary side pumps which are controlled by an integral thermostat. NRG Link is compliant with all solid fuel regulations with flow & return connections for the solid fuel appliance, a heat leak circuit and an efficient heat transfer medium to the sealed system. NRG Link is the only procurable Sealed to Open System Interlinking device that complies with all regulations and guidelines to interlink solid fuel open and sealed heating systems in a very safe and efficient way. 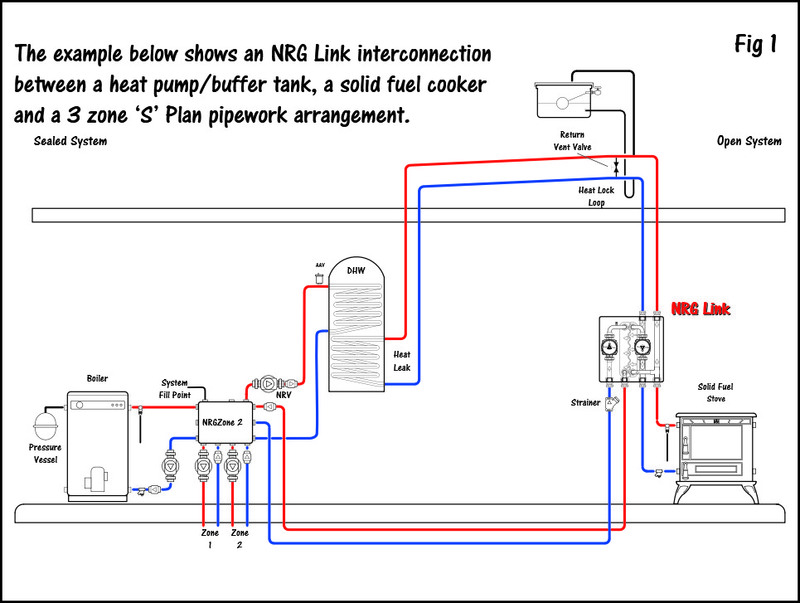 The NRG Link allows for a solid fuel central heating cooker or stove to be linked to a sealed heating system in retrofit or new-build situations. It includes for an open gravity circuit with standard safety facilities such as an open vent and cold feed facility that must be connected to a heat leak medium to comply with all manufacturer’s guidelines and regulatory conditions. Interconnection type systems have always been an attractive idea to homeowners but likewise dual systems were always been troublesome for installers to get the ‘link-up’ right. For that reason, interlinking systems was generally seen as a specialist activity that should only be undertaken by qualified and experienced heating engineers as incorrect designs can be expensive to run and could well be very dangerous for the occupants. The NRG Link greatly simplifies the whole process and when installed according to very simple instructions it makes the system completely safe and very cost-effective. Simple accessible connections will allow a proper flow through the solid fuel Gravity circuit ensuring a safe installation on the open-vented side and pre-configured secondary-side connections make attachment to sealed systems and easy task using a unique injector-based technology with top quality components. Helps ensure correct piping strategy by incorporating the Primary/Secondary piping requirement and an efficient heat transfer mechanism for perfect interconnection results with ‘top’, ‘side’ & ‘bottom’ Secondary connection points. Simple mounting method for the NRG Link unit allows for neat pipe-work and accessible connection joints for precise and good installations every time. Includes 1″(28 mm) unobstructed Primary Domestic Hot Water connections orHeat Leak Circuit perfectly in compliance with regulations and good trade practice. Quick access to all the internal mechanical parts and pipework connections allow for simple system installation & servicing for now and into the future. Safely and efficiently interconnect Open and Sealed systems. 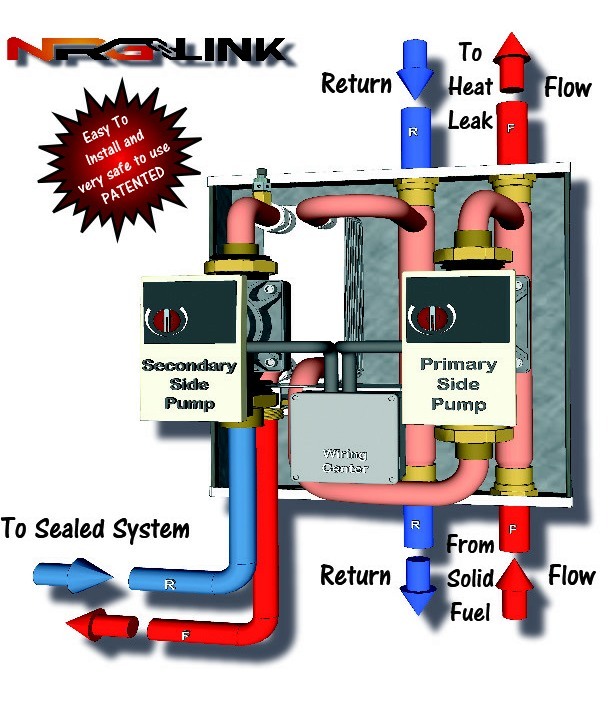 Safe, primary heat leak circuit and a secondary sealed system circuit in a simple regulation compliant way. The Open system can be at a lower level to the sealed system heat emitters in single or multi-floor premises. Can allow for heating pressurised Domestic Hot Water from a solid appliance in compliance with regulations. Eliminates the issues with mechanical quenching devices, valves and false pressures to allow for perfect secondary system circulation. Complete with Pumps, pre-wiring, thermostat and insulation to speed installation time and ensure correct operation.